Edward, Prince of Wales. The only son of King Henry VI, Prince Edward wears a coronet rather than a crown and the background to his portrait is decorated with ostrich feathers, which from the fourteenth century have been considered a symbol of the Prince of Wales. Prince Edward was killed in battle during the Wars of the Roses, when his father was displaced from the throne by Edward of York. King Edward IV. Edward overthrew King Henry VI and became king in 1461, having previously been Duke of York and Earl of March. He was the first Yorkist king. The background to his portrait is decorated with white roses and the supporters of his royal arms are the white hart of York and the white lion of March. It was during the reign of Edward IV that work began on the present building of St George’s Chapel. King Edward V. When his father, Edward IV, died in 1483 Prince Edward became king but he was only twelve years old. A struggle for power followed and the young king ultimately disappeared without ever being crowned and his uncle, Richard III, was declared king. Edward V’s 86 day reign as an uncrowned king is here represented by the fact that the crown is suspended above his head and not placed on it. King Henry VII. The first of the Tudor monarchs became king when he defeated Richard III at the Battle of Bosworth Field in 1485. He strengthened his claim to the throne by marrying Elizabeth of York, the oldest daughter of King Edward IV. Henry’s father, Edmund Tudor, was from a Welsh family which claimed descent from the legendary British king Cadwaladr and for this reason Henry used the red dragon as one of the supporters to his coat of arms, as did subsequent Tudor monarchs. The connection between these four men is that they were all served by a Principal Secretary who was also a canon of Windsor. Master Oliver King, educated as a King’s Scholar at Eton and then at King’s College, Cambridge, was appointed a canon of Windsor in 1480 and during his time here also acted as Registrar for the Order of the Garter. 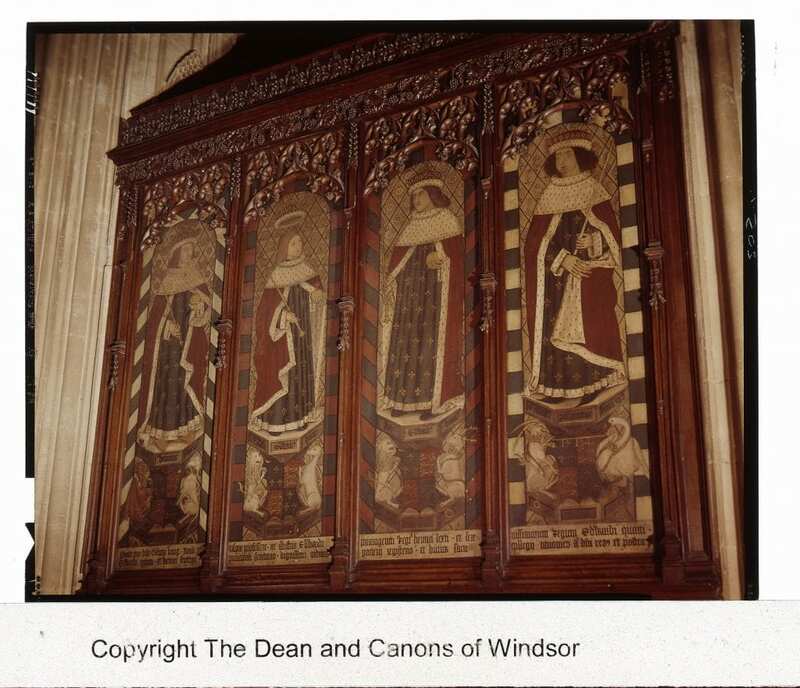 This panel hangs opposite a part of the Chapel known as the Oliver King Chapel, which was constructed in the 1490s and may have been paid for by King. It is not a chantry chapel as money was not paid for priests to say prayers there for his soul. There is a possibility that King was buried there after his death in 1503, but it is also possible that he was buried at Wells Cathedral as he was appointed Bishop of Bath and Wells in 1495; the location of his final resting place has never been confirmed. The painted panel is believed to date from about 1492-95. The sign in Latin underneath describes Master Oliver King’s eminent career and asks the reader to pray for him.